It's nearly here! Pancake Day (Shrove Tuesday) is in just a few days time on the 9th February. Woohoo! Time to get out those pans, make your batter and start flipping! Are you ready? 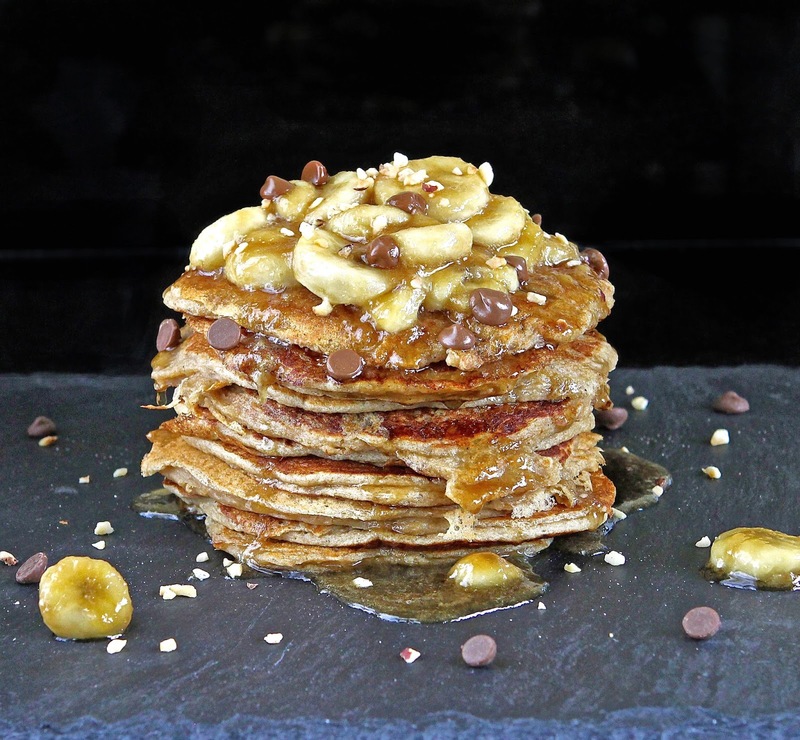 Pancakes are amazingly versatile and varied........ sweet or savoury, wafer thin or fat, rolled, folded or piled high....... You can eat them pretty much any which way and they will fill you with comforting yumminess. The last day before the fast of Lent, Shrove Tuesday is traditionally the day for clearing the cupboards of excess and gorging on the contents in preparation for leaner weeks of contemplation and prudence. 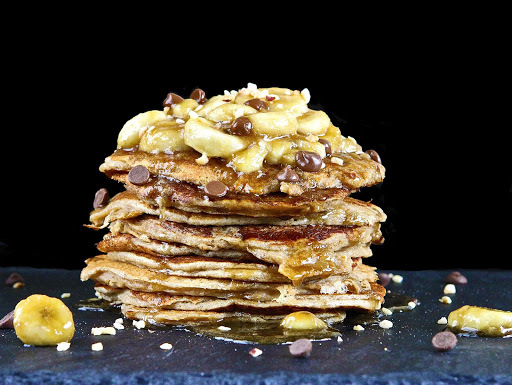 The pancake has become synonymous with this feasting and in the modern world, seems also to have become a creative expression of culinary diversity, often impressively presented as magnificent towers. We love pancakes in our house and although we don't eat them as often as we would like, they are definitely not reserved for Shrove Tuesday. On the other hand, if they have been missed off the menu for a while, Pancake Day is a great kick up the backside to remember how wonderful they are. I've developed a few gluten free pancake recipes over the last few years. 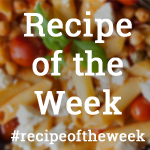 One of my favourite savoury versions is made with a base flour of oats.... healthy and delicious, you may want to check out the recipe here. It makes a wholesome alternative to the traditional wheat-flour batter and the perfect wrap for so many fillings. These Banana Buttermilk Pancakes are more 'American stylie' - thick, luscious, fluffy and made for tower-building. 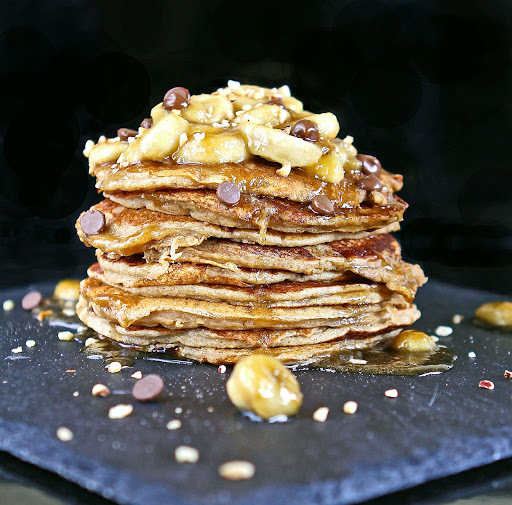 Made with a nutritious mix of flours, egg, buttermilk, coconut oil and bananas and lightly sweetened with coconut palm sugar, they may be in the 'dessert' camp of pancake, but you can feel fairly virtuous that they remain a healthier option. They are incredibly satisfying too...... we ate them for brunch and they kept hunger at bay for hours! Okay...... so we caramelised a bunch of bananas in brown sugar syrup to make Caramelised Banana Sauce and spooned the whole lot over the top......... This action may have knocked me off the moral 'healthy-eating' pedestal, but it tasted fantastic and was more than worth the act of moral corruption that ensued...... What is life for if you can't live a little now and again? I made this batch of pancakes with Miss GF, who is getting increasingly independent in the kitchen..... I am currently in negotiation with her to do a little intermittent blog series along the lines of 'Miss GF Learns to Bake' (the title needs serious re-working). It feels really important that she learns the intricacies and foibles of gluten free cooking as early as possible, so that she feels confident enough to go it alone when the time comes. I don't think I have too much cause for concern...... she will often throw herself into culinary creation when our backs are turned....... On one recent occasion, I had to talk her through making meringues (on the phone - hands free of course) whilst driving down the M2 (she was at home in the kitchen and had banished her father to the living room). By the time I arrived, she had them piped and slowly baking in the oven! It may be good to share some of her enthusiasm with others who have gluten free kids in the hope that they get the bug too. When it comes to flipping (or even turning) pancakes, Miss GF is way more proficient than I am. We took it in turns to make two pancakes each before swapping round and I have to say hers were way more uniform in shape than mine were....... It's fantastic to see her fearlessness in the kitchen! Take your pick..... they are all fantastic recipes and I think there is probably something (gluten free) for everyone in this list! Simply Eggcellent with lovely Dom at Belleau Kitchen. The linky which celebrates our culinary 'eggsperiences' has given an open theme for sharing this month. 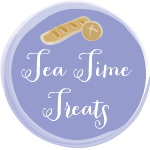 Tea Time Treats, this month with Karen over at Lavender & Lovage (and Janie at The Hedgecombers). February's theme is a seasonal 'Pancakes, Hotcakes & Waffles'. 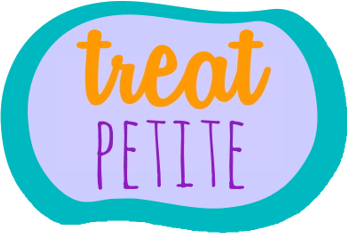 Treat Petite this month being guest-hosted by United Cakedom on behalf of both Cakeyboi and The Baking Explorer. The theme set is Like It, Love It, Gotta Have It....... We seem to get through mountains of bananas in this house..... we just love them! And this week, we just gotta have them in pancakes! 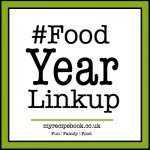 #FoodYearLinkup with Charlotte's Lively Kitchen...... This month celebrating Shrove Tuesday! 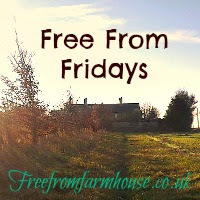 The No Waste Food Challenge with Elizabeth's Kitchen Diary...... This is another fab recipe for using up those extra-ripe bananas. 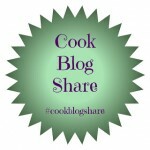 Cook Blog Share this week with Sneaky Veg. 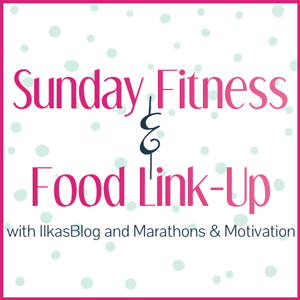 Sunday Fitness & Food with Angela over at Marathons & Motivation. Pancake Batter : Weigh and mix together the flours, sugar, baking powder, bicarbonate of soda and salt in a large bowl. Give a little whisk to fully combine and ensure all lumps are completely broken down. Set aside. In a separate bowl, beat together the buttermilk, mashed banana, eggs, melted coconut oil and vanilla paste, until thoroughly combined, light and airy. Make a well in the centre of the flour mixture and pour the liquid into the bowl on top. Stir the mixture briefly to combine slightly and then whisk until the ingredients are evenly amalgamated. Do not over mix. Let the mixture sit for 5 minutes whilst the bicarbonate of soda activates. Prepare your frying pan by brushing (or sponging) with a little vegetable, sunflower or coconut oil and heat over a medium setting. When the pan is hot, add a large spoonful of batter (I use a third-cup measure), and gently push out to form a pancake shape about 5 mm thick. Allow the underside to cook and when the bubbles that form on the top have popped, flip the pancake over and cook the other side. Repeat this process until all the batter has been used. Place the pancakes as they cook in a pile on a heat-proof plate, wrapped in a clean tea towel and keep warm in a low oven until ready to eat. Caramelised Banana Sauce : In a medium saucepan, mix the sugar and water together and heat over a medium heat, stirring until the sugar has melted and darkened slightly. Be careful not to over-cook, or the sugar will burn. Add the sliced bananas to the pan and gently toss in the syrup, continuing to heat gently for a couple of minutes. Serve the pancakes with the sauce and a sprinkling of roasted chopped hazelnuts. For extra decadence, throw on some chocolate chips and maybe even some berries! These look so scrumptious! 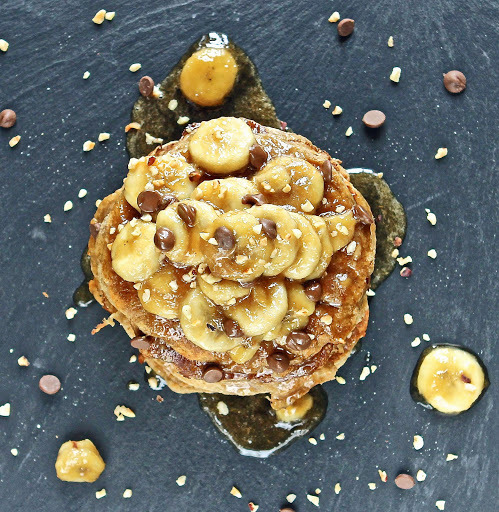 I love the addition of caramelised banana - genius! My mouth is genuinely watering!! Thanks for entering into Treat Petite. Thanks Kat.... I could quite happily have eaten a whole bowl of the caramelised banana on its own..... But the pancakes were so good with them, that I ate a pile of them as well! That's a lot of different flours, is it possible to use one of the GF flour blends available in the supermarkets instead? Thanks Charlotte. The bananas were lush and really quick to throw together..... so absolutely worth the extra effort. I mixed the flours predominantly because I wanted to have a healthy and nutritious mix (which you rarely get from commercial blends, that are mostly rice-flour based). Although I haven't tested the recipe with supermarket flour, I would not see a significant reason why they wouldn't work...... although for texture, I would still add the oat flour in the mix. I've never been mad for pancakes, but if anyone was ever going to 'turn' me it would be you with these photos! Thanks for letting me know about the linky. I will pop over and add them on! Thank you for joining the Linky! I have pinned the recipe to be sure to try it. 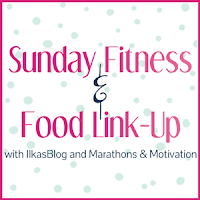 Hope to "see you" next Sunday at the Fitness & Food Link-up. ps-I love the the info. you gave about "Pancake Day"
Thanks Angela. Let me know if you make them and how you find them! I've been away for a few days, so missed this weekend, but I'll try to join soon! Woow! These pancakes look great! Love the banana on top. Great presentation (as always) and a great combination of flavours! Oh boy these look good! You kill me with your creations. Once again I am attempting no sugar so these babies are out for me! Enjoy them though...and thank you so much for linking to my recipe!! I love pancakes, though because OH is fond of them (! I know) I don't have them as often as I'd like. Mum always used to make them for my brother and I when we were young on Shrove Tuesday and it was always so much fun watching mum flip them and then eating them! Lovely to hear your daughter is so proficient in the kitchen. Thanks Angela. I love those little childhood memories which pop up with festivals. I think most people probably have some great pancake memories from childhood. They are one of those dishes which are iconic and traditional! 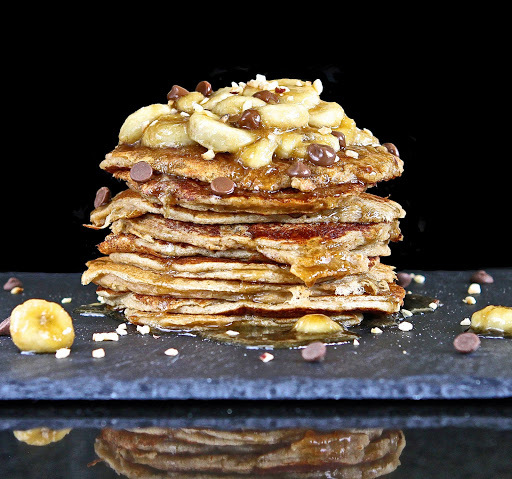 Your gluten-free Pancakes look absolutely fab! Pinning! I will be making these! I'm so sad that pancake day is over! Although I don't really need it to be pancake day to make pancakes! These look absolutely amazing! Thank you for sharing with this month's treat petite! Thank you Lisa. You're welcome..... I would be happy with these any day of the year! I'd definitely like to try it as I'm sure it tastes amazing! Thanks for sharing!